On Trail Running and Feeling Like "I Don't Want to Do This Again"
This summer, I ran a 20-mile trail race in mid-July, another 20-miler in early August, and about 15 miles as part of a Ragnar Trail WV relay team in mid-August. 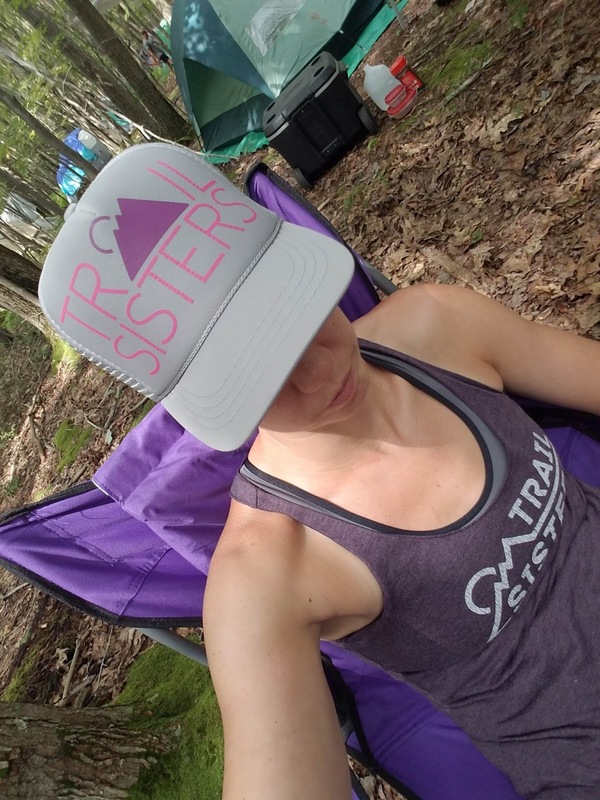 During my first 20-miler, I wanted to cry for nearly the entire back half of the race. I didn't feel great during the first half for no particular reason—I was well-fueled, well-hydrated, though maybe not well-rested. I just felt, I don't know, not good, not powerful, not fast. In the last five miles, I got so tired that I tripped and fell about five times, often over nothing but my own two feet. I did finish, only cried a little bit out of relief that it was over, and felt recovered within a few days. 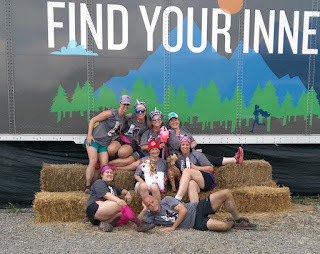 But the experience left me feeling like I didn't want to run any trail races again. Why do I need to compete? I wondered. I can just go out and hike/run trails on my own. But I had already signed up for another race, a 50K with two drop-out points: one at 17 miles and another at 23 miles. 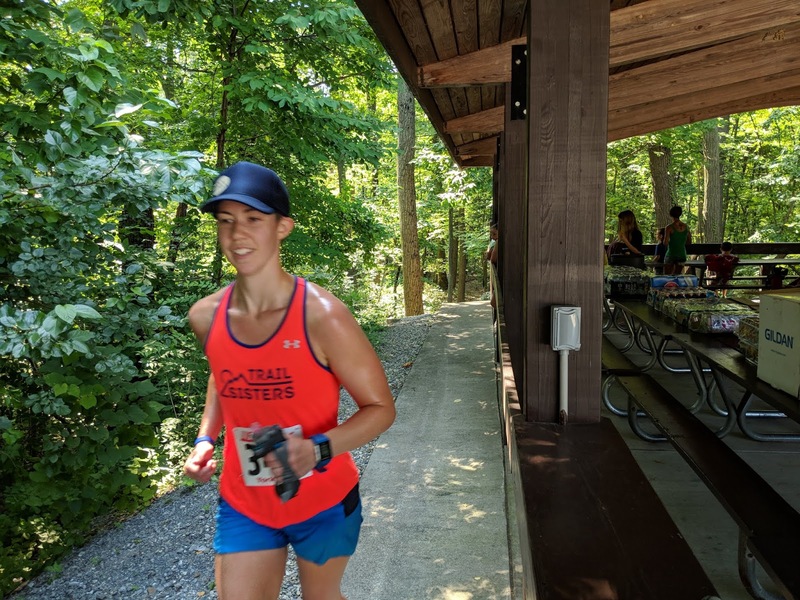 When I signed up for the race, I wanted to try for 50K, but I knew a few weeks before that I wasn't properly trained or physically prepared to take on that many miles. So I planned to hike/run until the 24 mile drop-out point. After getting to the 2nd aid station about 13 miles in, I thought nope. I'm done. I anticipated a difficult mountain trail, but this was way more than I bargained for, certainly way more than my body was prepared to do. The whole course went up then immediately down a mountain then immediately back up. The downhills were on wet boulders. I ran out of water. My calf cramped up. On one hill—after I ran out of water and while recovering from a cramped calf—I had to take three steps and rest, take three steps and rest. I wanted to quit there, but the only way to make it end was to make it back to my car. So at the 2nd aid station, I followed the signs for the 17-mile drop-out. Only four miles to go. In about 3.5 more miles, I heard voices and thought I must be nearly finished…until I realized I had come back around to the same aid station I had just left! Disheartening. A friend at the aid station said if I just followed the road, I'd be back to the starting point. How far? I asked. Not far, she said. Only about three or four more miles. So. What else could I do? I followed the road, eventually saw where I made the wrong turn, found where to make the correct turn, finished the race on the trail, and logged about 20.7 miles total. I didn't cry this time. There was some amazing food at the end and some awesome people to talk to and re-live the horrors of the trail. But, again, I was left with that feeling like, "I don't want to do this again." 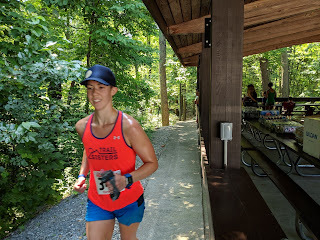 The week after that was Ragnar—an experience worth it's own blog post, but in summary it was a two-day, three nights camping, relay trail race in WV. Each relay team member runs three times to cover each of the course's three loops of varying terrains and distances equaling about 15 miles total per person. I loved camping. I loved the shorter distances. I even loved when the extreme storms and rain delays caused us to "triple up" our loops and I got to run two of my three loops with teammates. That was fun. I didn't go race-pace fast, but I got to go fast enough that it was challenging and enjoyable. My body was better prepped for those shorter distances, in this case between 3.5 and 6.7 miles. It renewed my love of and faith in trail running. Moral of the story is that I need to better prepare if I plan to race longer distances or stick with the shorter distances! I don't have any more trail races planned, but I'll be on the look out for 5K or 10K races. I am lucky to be an athlete and have the body, conditions, and support to pursue my athletic goals. I think about this as I jump into the cold pool before 6 a.m. on a work day; as I run in a hot, humid Pennsylvania afternoon; as I wake up with sore knees, a stiff neck, and a ravenous hunger; as my students and co-workers look warily into my chlorinated, blood-shot eyes ringed with goggle marks; and as I brace myself with two hands to sit down on the toilet when my legs are just too sore to do it themselves. I always think I could do more, work harder, eat better, sleep sounder. But I work with what I have, make choices to create even better conditions for athletic performance, and express gratitude that I can participate in activities I love every day. Yes, I work hard and make sacrifices to dedicate myself to my sport, but I am also privileged that I have the body and the resources like time, money, and support to work towards my athletic goals. I am more privileged than many and maybe not as privileged as some, but recognizing my own privilege is the first step towards eliminating oppressive situations. Eliminating oppression in sports—particularly for women—is one of my goals. I will continue to explore this topic in future posts. But in the meantime, consider this: what privileges have affected you and/or your athletic career? And, sure, I could have done more to be better prepared. One can always do more to be better prepared. But I knew I was as prepared as I could be at that time. I told myself I’d go give it my all, whatever “all” I had in me on those two days of competition. On Saturday, Brian came with me. We got to the pool 15 minutes before warm ups which gave me just enough time to squeeze into my new compression suit. It only took me about 8 minutes to put it on this time, and once I had it on, I realized it was too big! Not so big that I couldn’t wear it, but big enough that I could have gone down a size. It was a little roomy in the hips and bust because I had lost body fat between the time I bought it and tried it on and race day. Oh well. It was still plenty tight and felt comfortable during warmups. 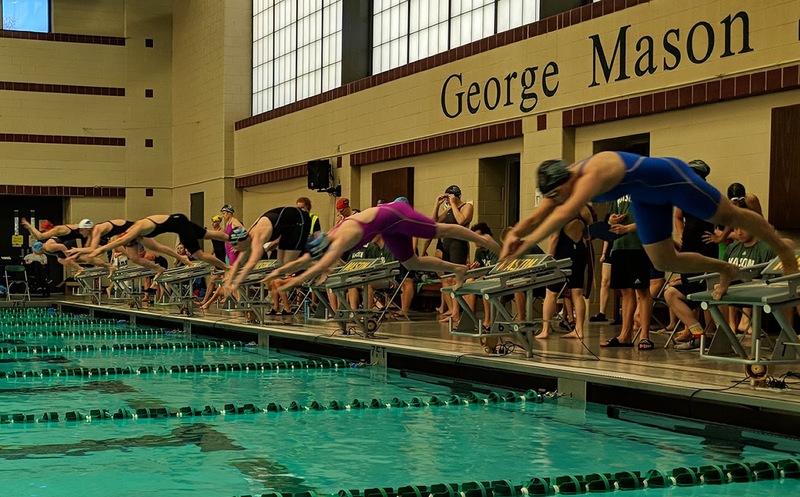 The 100 free is a sprint, so I went out fast and held it for as long as I could. I won first place in my age group with a 55.94! Not to be cliché, but my draw dropped. I had just dropped 1.62 seconds from my adult best time. I hadn’t swum a 55 since college. I looked for Brian in the bleachers, and he had moved to the edge of the pool and had his arms pumped in fists above his head. Before the race, I told him I was hoping for a low 57. Last year, this would have been a top 10 time in the nation for USMS. 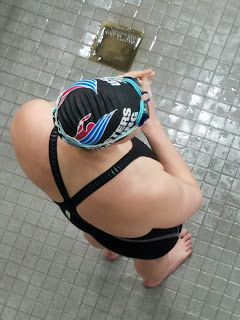 The last time I raced the 500, I felt tired and sluggish, so I wasn’t sure what to expect at Zones. But after the 100, I was feeling pretty confident, so I also went out fast—not at a sprint, but fast—and held just about the splits I wanted to hold. Brian counted for me, and I told him to move the counter up and down if my 50 splits went over 35 seconds. He only did it once, so I knew that I was on track to get a personal adult best. 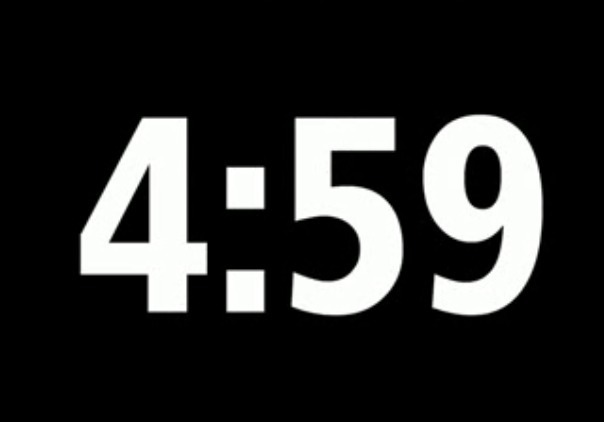 I hoped to go under 5:40. 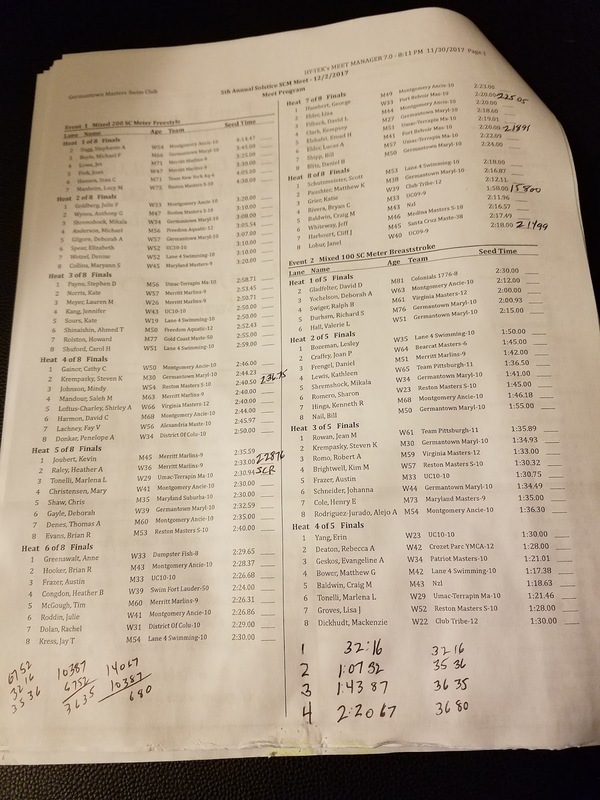 I finished 3rd in my age group with a 5:36.59, shaving another 6.82 seconds off of my previous best time and was 14 seconds faster than previous seasons. I was pleased enough with my performance on day 1 that it almost didn’t matter what happened on day 2. My mom went with me this day, and on the drive down I could tell I was much more tired than I had been the day before. 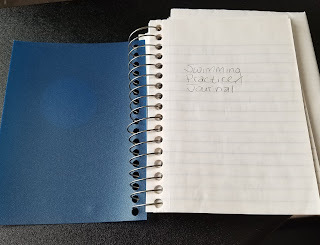 I hadn’t swum in a multi-day meet for a few years, but I anticipated being a bit more tired, maybe a bit sore. 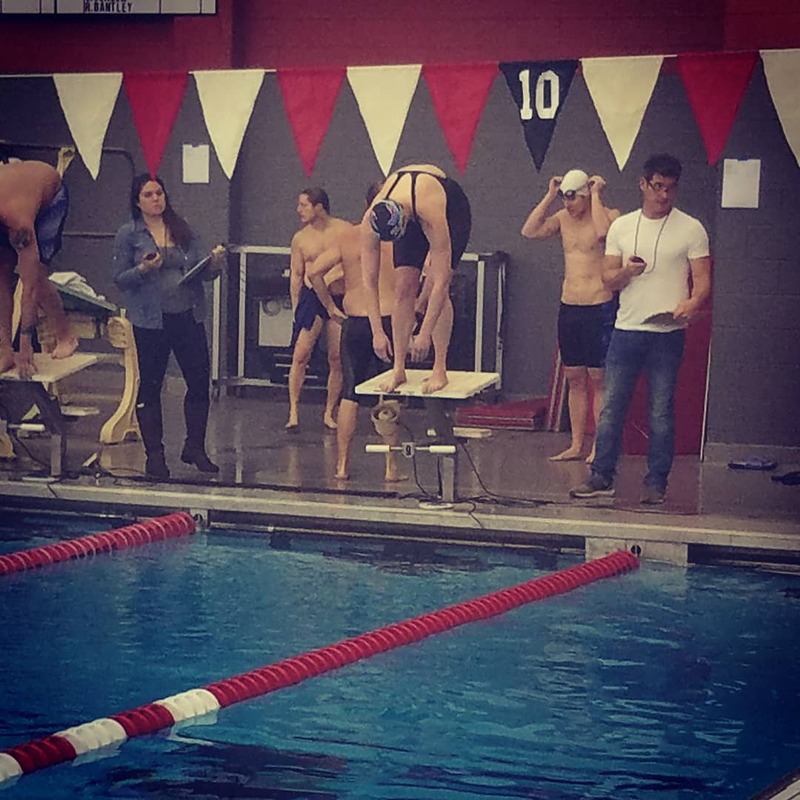 In March, I had an amazing 200 free race because I was neck-and-neck with another swimmer the whole way until the last few yards when I pulled ahead to out touched him by .16 seconds to finish in an adult best time of 2:04.47. 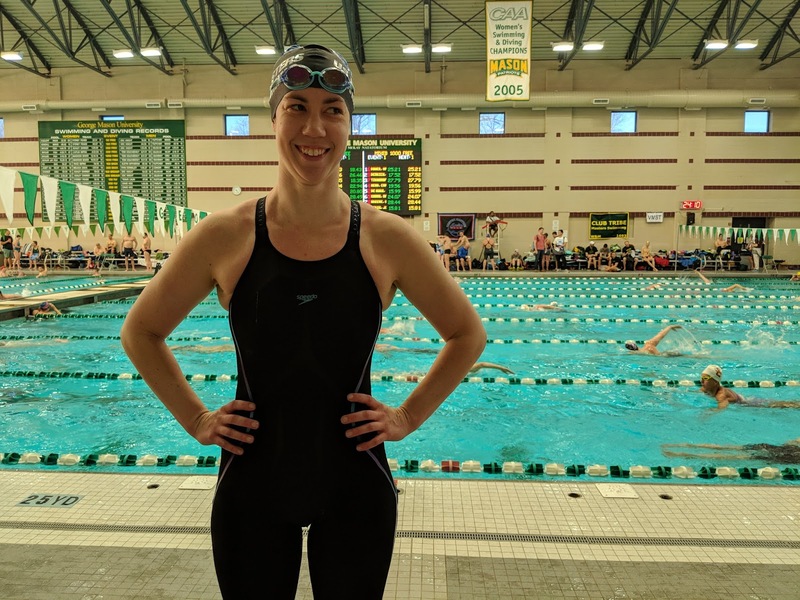 So, I was excited to race the 200 free again, this time against fast women. I finished 2nd in my age group and 3rd overall with a 2:02.73, knocking another 1.75 seconds off my time. Again, I couldn’t believe it. I was so excited to have done a 2:02, a time I hadn’t done since college. Mom gave me the thumbs up from the stands. I had put everything, everything I had into that race. I was drained. And I felt amazing. I hadn’t raced the 50 free yet this season and hadn’t raced it in over a year. 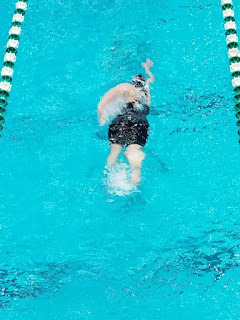 My previous best time was a 26.86, which I had done four years ago, but I had already beaten that time with my 100 split the day before with a 26.58. I finished 2nd in my age group with a 26.36 and was pleased to have placed that high. I had kind of hoped to go a 25, but I’m pleased with the low 26. I couldn’t be happier with my Zones performance. I surpassed my goals, felt amazing in the water, and enjoyed spending time with Brian and my mom. What excites me is that I know I can go even faster than that. I know the weaknesses in my training and how to get stronger. I know my strengths and how to continue to use them. I can’t wait to see what happens next. *I may be as fast as I was in college, but that's also about as fast as I was as a 12 & under! 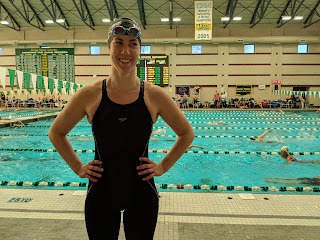 I competed in the Germantown Masters Solstice Meet on December 2 because I wanted to set a baseline for my Wildly Improbable Goal for the 500 free. It was at a short course meters pool, so the meet had a 400 meter free, rather than a 500 yard free, but by the time I signed up, the 400 free was already sold out. Bummer. Almost didn’t sign up at all, but then my parents agreed to go with me. “Sounds like fun!” they said (not sarcastically). Like old times, my dad wrote down my splits. 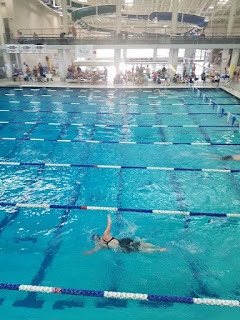 The pool was lovely: very deep and very bright, and there was a good stock of fast swimmers there from Baltimore, D.C., and surrounding areas. I felt good in warm ups, but as soon as I got out of warm ups, I got nervous! 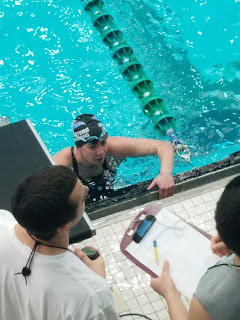 The 200 free was the first event, and I hadn’t been training or mentally preparing for that distance. 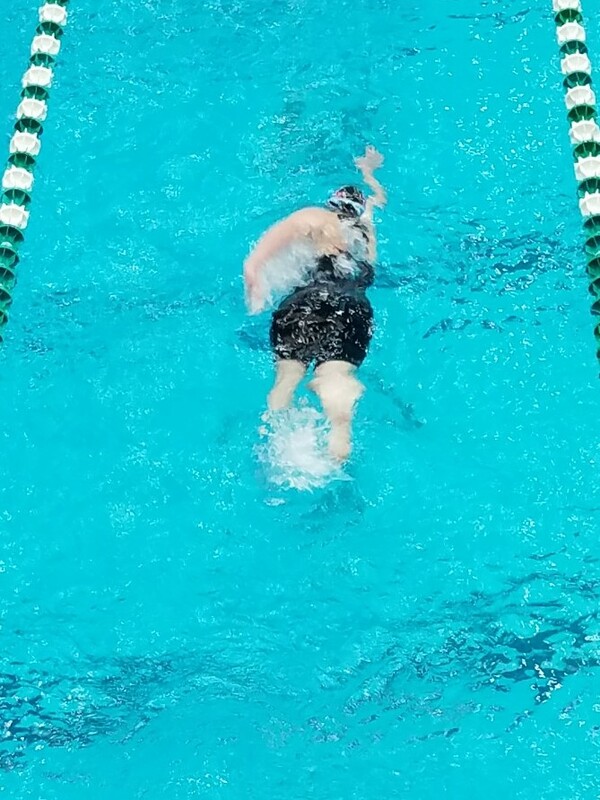 I love the 200 free, have raced it a hundred times, but it’s a race that’s short enough that you’re supposed to sprint it, but long enough that you can fall apart if you sprint too hard or too soon, especially without the right training. But then my dad reminded me of the times I swam at the Elite Meet and Junior Olympics when I was 12 years old. 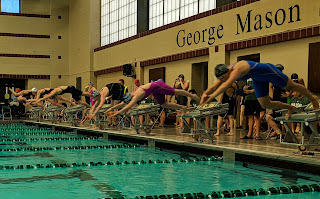 There were 28ish heats of 11-12 year old girl’s 200 free, and I was seated first at both (and won both, too). 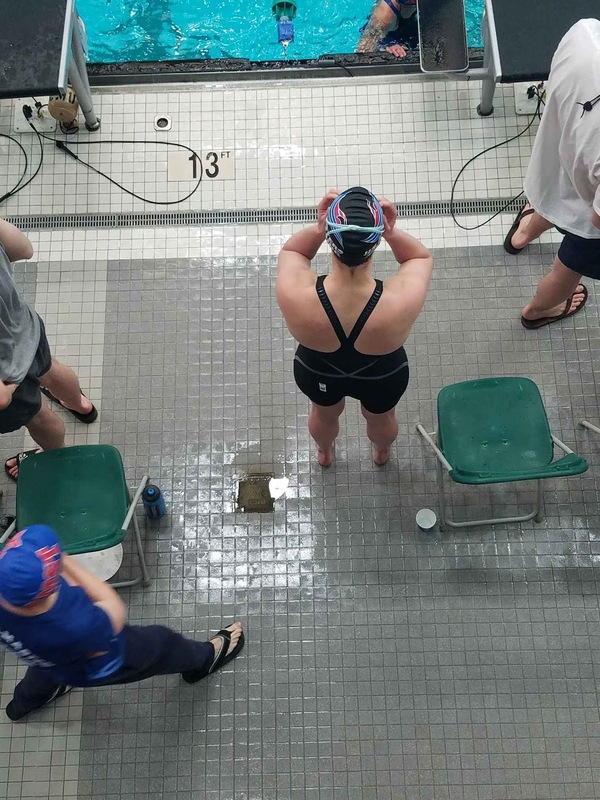 “That’s a lot of pressure, to be seated first out of that many swimmers,” he said. But there certainly wasn’t any pressure at the masters meet. I just needed to get my starting point, my baseline. Between races, I sat with my parents in the spectator gallery that overlooked the pool. 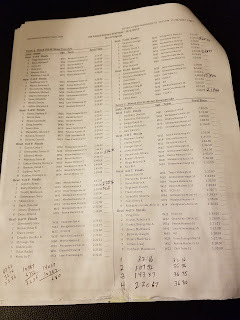 We passed the program back and forth, marveling at the ages of some of the competitors (62, 74, 81). I told my mom she could be in there competing, if she wanted to. 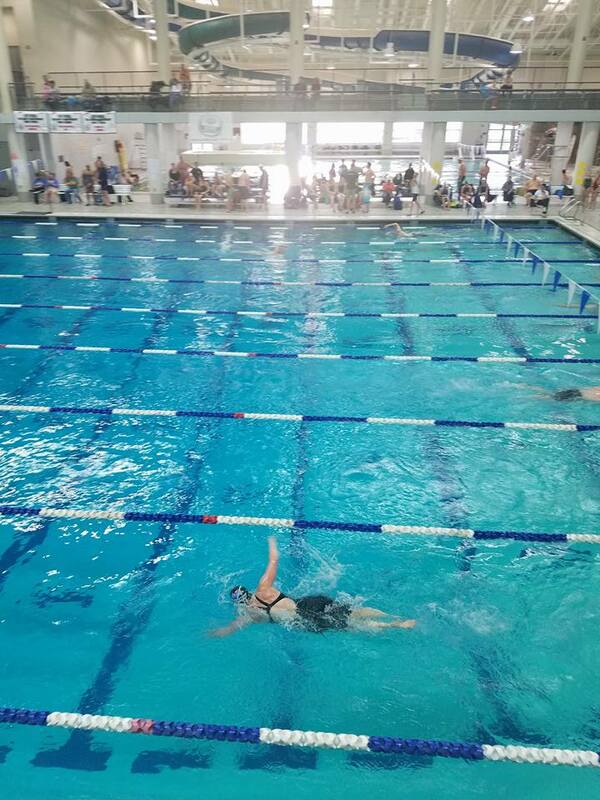 We cheered for one of my childhood teammates as she swam the 50 backstroke. 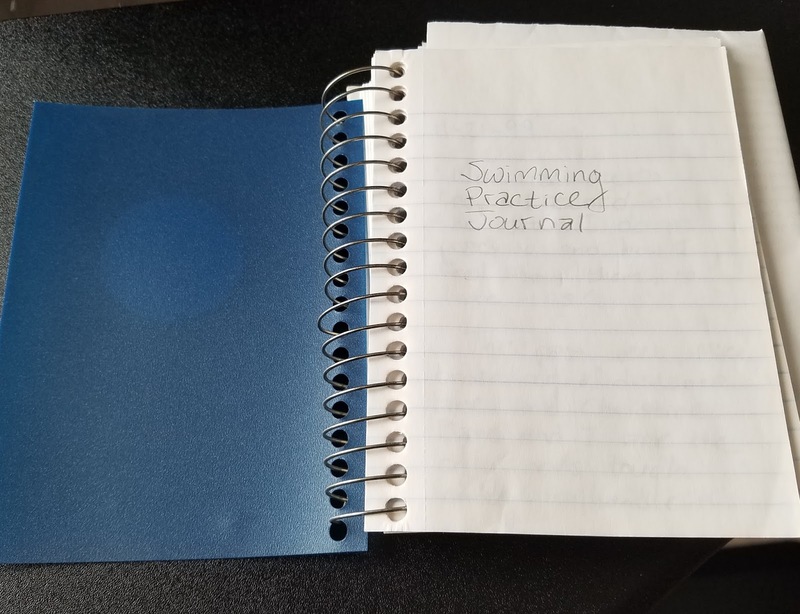 Soon, it was 100 free time. My parents took me to a BBQ place on the way home, which was delicious and worth mentioning here because no swim meet excursion is complete without an epic meal with family and/or friends. Couldn’t have been happier about my races. Set a great baseline. It shows that the way I’ve been training lately has helped, so I will keep it up.